Edinburgh centre Nick De Luca made his debut for Scotland against France in the first game of the 2008 Six Nations. Having already represented Scotland at all age-grade levels as well as 'A' level, De Luca held on to his position for the following game against Wales. Winning two further caps as a replacement against Ireland in the Six Nations and in the second Test against Argentina in June 2008, De Luca regained his starting berth for the 2008 autumn internationals. De Luca started at inside-centre against the All Blacks and retained his spot for the subsequent Tests against South Africa and Canada. De Luca continued to be involved in the Scotland squad, making 12 appearances mostly from the bench, during the 2009 and 2010. But failed to nail down a starting place. 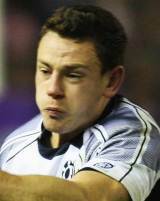 However following an injury to Graeme Morrison, he did start three of Scotland's five Six Nations matches at the start of 2011 and was selected in Scotland's provisional World Cup squad. De Luca was a member of the Scotland 'A' squads for the 2006 and 2007 Churchill Cup tournaments in Canada and England respectively. At club level De Luca began as an apprentice with Edinburgh in 2005 before joining Border Reivers for the 2006-07 season. Following the region's dissolution in 2007 he returned to Edinburgh.